Well it is really warming up here in North Carolina, but my sewing is for the cold time of year instead! Recently I sent out a couple of projects in Holiday Bouquet to magazines. They will run them this winter but I thought I'd give you a sneak peek! Unfortunately this is all that I can show. I have two other projects that I'll be able to show soon - one is a pillow version of O' Christmas Tree, my class for the Charlotte Quilters Guild on July 11th. 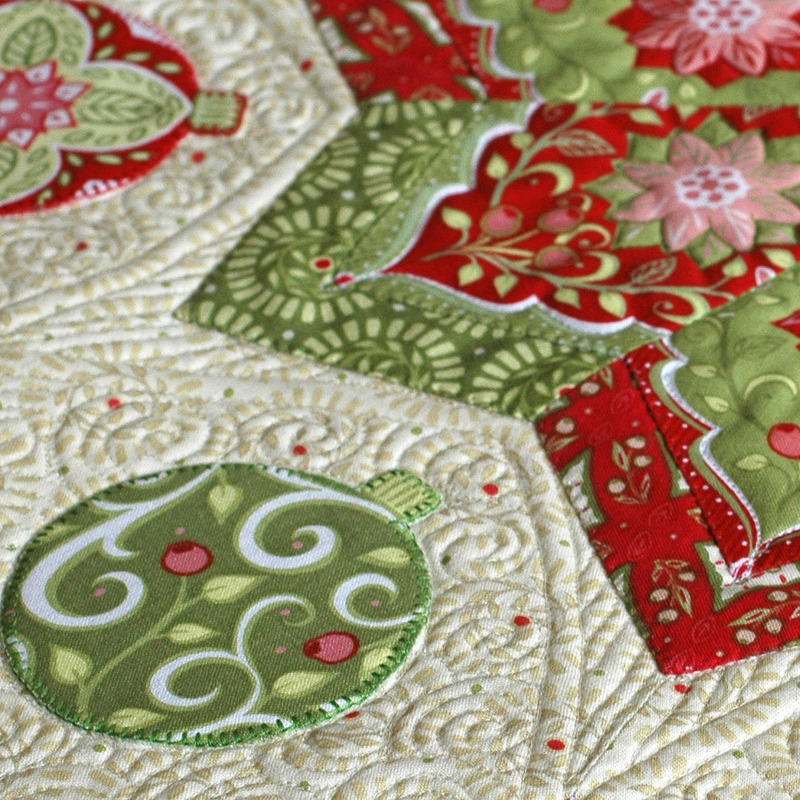 The ornaments are REALLY fun to back with fusible, cut out, and applique. Some SKUs of Holiday Bouquet are already selling out, so if you were planning on ordering, make sure to place your order soon! On another note, I was SO sorry to miss speaking to the people at Quilter's Loft in Mooresville on Thursdya night. We will definitely reschedule. I wouldn't have dropped out last minute like I did but this happened about 1/4 mile from the interstate. I know. Apparently something hard and small punctured a hole on the inside of the tire and it completely collapsed. Thanks to everyone at Quilter's Loft for being so understanding. 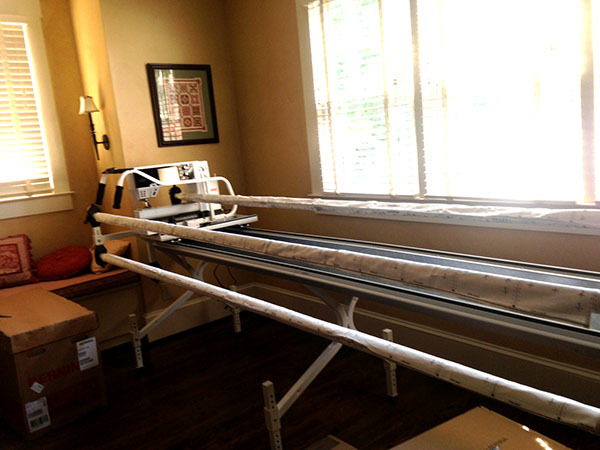 The Bernina quilting frame with Quilt Motion software. Isn't she something? She needs a name, don't you think? Any suggestions? Hope you are escaping the heat and happy sewing! HELLO,JUST WANTED TO LET YOU KNOW HOW BEAUTIFUL YOUR CHRISTMAS STITCHING IS LOOKING! 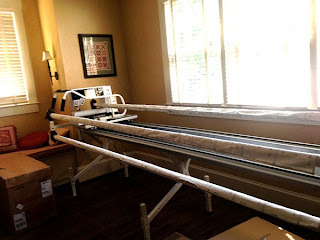 Your sneak peak it gorgeous, and oh my goodness, do I want that longarm! How about 'The Nina B'? She's almost as big as a small boat, and probably takes up the same amount of space. 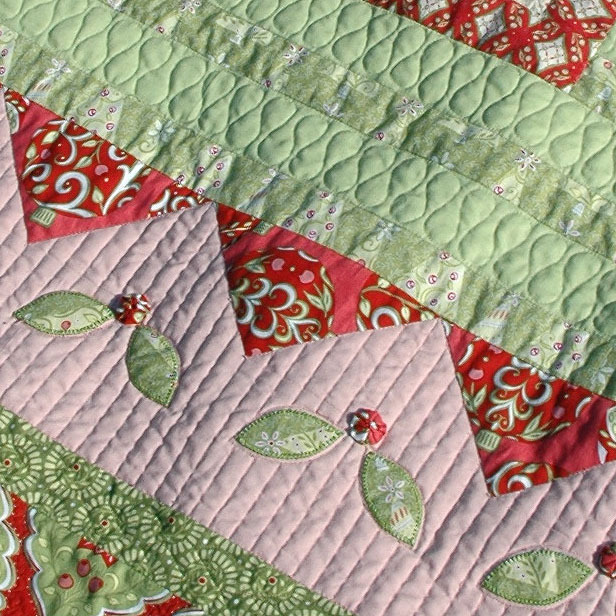 Your Holiday Bouquet fabrics are just beautiful, as are the quilt projects. Amanda, love the fabric and the beautiful quilting too! Congrats on the new baby! Lol. Wow, what a fun new toy to play with! I hope you blog about it like you did with the B 780. I don't know much about how the Bernina quilt frames and Quilt Motion work. Very intriguing! I also love the quilting motif on the solid green border of the second "sneak peek" photo. It reminds me of old-fashioned ribbon candy. Are you able to quilt that completely freehand, or do you mark it in some way to keep the swirls so even and uniform? 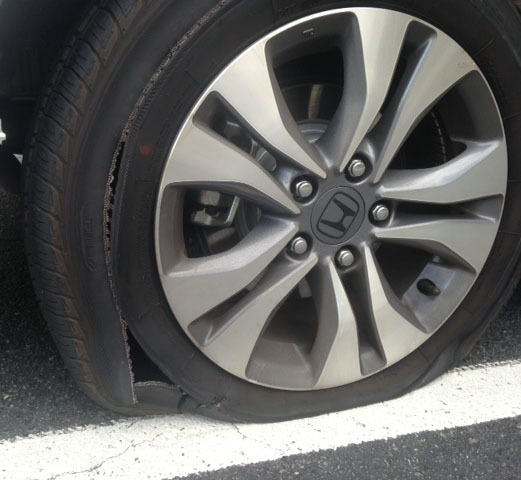 Sorry to hear about your flat tire. I hope this is a better week for you! The sneak peak is torture. I can't wait to see more. I guess I really need to get my yardage before it all disappears. Congrats on the new toy and I hope you've figured out a name for her by now. Modern Holiday and all my new patterns are in!!! New Patterns for 2013 Spring Market!